The Fall Edition of ESTA’s Protocol is now live online! 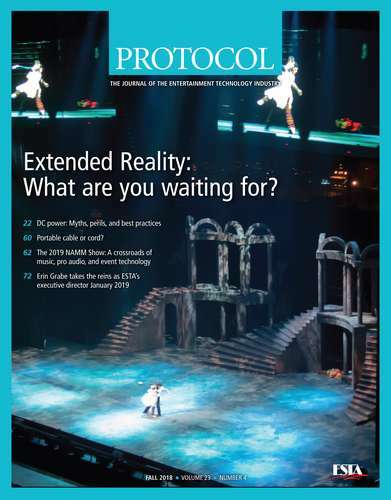 What's New > The Fall Edition of ESTA’s Protocol is now live online! Learn more about Protocol at http://esta.org/Protocol/protocol.html. This issue’s CITT/ICTS News column: Sara Munčs does a recap of last month’s dynamic Rendez-vous Conference held in St. Catharines, Ontario. James Simpson, lighting visualizer at the Royal Opera House in London, writes about the use of immersive technologies, including AR/VR in lighting design. Learn about batteries and DC power distribution by Jim Smith. Lex Products' Bob Luther clarifies "Portable Cord or Cable?" in his helpful, quick read. ProSight’s Mike Kelly discusses “Crowd Management: The Ever-Adapting Emergency Master Plan”—a must read for all involved with events and insuring everyone goes home safely. Guy Holt wraps up his series on solving generator-related LED luminaire power quality challenges. Learn why you should plan to attend The NAMM Show next January 24 – 27 in Anaheim, CA. Karl Ruling reviews the new Scenic Automation Handbook by Gareth Conner. Milton Davis shares what you missed at the recent Plugfest—a vital event for product developers looking to resolve interoperability challenges and test products for compliance with ESTA’s ANSI-accredited Technical Standards Program. Eddie Raymond’s past three “Take Away” columns on harassment and abuse within the industry resonated with readers. He continues the dialogue on this timely and critical topic. Bill Groener is back with his popular Soft Sell column—learn where he takes readers next to improve people and selling skills in "Invest the Time to Do Your Research." USITT’s David Grindle invites applications for Innovation Grants to fund new ways to develop inventive products or processes to advance the industry. Mike Wood shares a thought-provoking read on "The Interconnectedness of All Things" in his “Out of the Wood” column. “Shadow, Light, and Truth” column by Richard Cadena explores the impact of asbestos in "Asbestos: Magic or Menace?" The ETCP Certification Council has lowered the eligibility requirements for candidates applying to take the Portable Power Distribution (PPDT) examination—read the update in the ETCP News column. ESTA’s President Jules Lauve outlines the many new initiatives for your Association. Meet Erin Grabe, ESTA’s next Executive Director. After a year of shadowing Lori Rubinstein, Erin steps into this key role for your Association on January 1. Nick Champion shares how ESTA’s Member Chat!—the vehicle for members to connect with your Association—was used for ESTA Annual General Meeting and what was covered. Once again at The 2019 NAMM Show, ESTA will provide four tracks of educational sessions, curated by ESTA, and offered free to registered NAMM attendees—plan to attend and take advantage of the opportunity January 24 – 27 in Anaheim, CA! Production Equipment Rental Group News by Harry Box reminds readers of the requirements for packing lithium ion batteries for shipping. 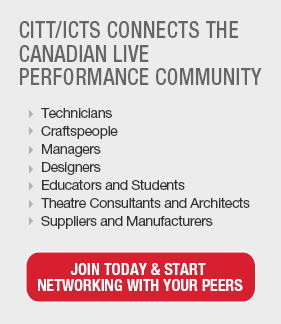 Follow Behind the Scenes News to learn about BTS initiatives and ways to support your industry charity. This issue’s highlights include: This issue's CITT/ICTS News column written by Sara Munčs, coordination assistant at CITT/ICTS.